The truth is that FM’s reticence with the press may have cost it some marketshare, as the newer companies I’ve mentioned have actively courted attention in the audiophile mags, while FM has continued to forgo such publicity. In part to belatedly counter this trend (and in equal part to remind folks that what was once considered extraordinary is still extraordinary) FM has now decided to allow a few folks (like me) to review its latest designs—in this case its extremely compact and comparatively affordable Resolution Series electronics, comprising the $17,750 155 MkIIR linestage preamplifier, the $21,600/pair 108 monoblock amplifiers, and the $13,975 122 MkII phonostage. As I haven’t, until recently, heard a complete system of FM electronics, I can’t really comment on how the marque has sonically evolved over the decades. What I can comment on, however, are some of the important ways FM gear has remained the same, starting with how Huber builds his gear. Almost all ultra-high-end manufacturers claim to use the best (lowest-distortion, highest-resolution) parts in their electronics and loudspeakers. FM Acoustics is no different. On visiting Manuel Huber’s lovely facility in Horgen, Switzerland, I was shown bin after bin of high-end capacitors, resistors, switches, etc. But the thing that stuck with me wasn’t the exceptional quantity and quality of these components; it was the incredible lengths that Huber and his team go to perfectly match each of these parts to one another in every measurable parameter. In addition, almost all ultra-high-end manufacturers claim to build their circuits to the highest measurable standards. What many of them don’t tell you is that the sub-assembly boards they are using aren’t made in-house (although they are painstakingly designed in-house); they are built by second parties with the equipment and expertise to populate and wave-solder each board to order. The sub-assemblies are then installed at the manufacturer’s facility. But the precision matching of the parts on the boards and the wiring and soldering of each in place—the very things that FM Acoustics spends so many man-hours perfecting—is not being done by the company you’re buying your component from. Fourth, since much of his time was spent outfitting recording studios during the LP era (recording and mastering houses were some of his earliest customers), Huber has never abandoned the vinyl disc (or, as far as I know, offered an FM Acoustics DAC). For him, the LP was, is, and remains the king of sources. Indeed, Huber has pioneered phonostages with adjustable low- and high-frequency eq curves, which he claims more precisely and accurately equalize recordings made by different labels, all of which (Huber maintains) used different eq curves to master their discs. Although a strong case can be made that the RIAA standard (i.e., the RCA New Orthophonic curve) was universally adapted at the dawn of the stereo era, there is no question that during the mono era almost every recording company used its own eq and that the playback of such mono recordings greatly benefits from the use of these “house” curves, which (outside of the Japanese company Zanden) can only be precisely applied via the elaborate controls on an FM phonostage. The bottom line is this: Whether you believe that all records need different eq or that only pre-stereo-era mono recordings do, FM Acoustics phonostages give you the means to accomplish either or both tasks with confidence and precision. The latest FM phonostages also give you another indisputable advantage. Somehow Huber has engineered a circuit into the FM 123 and 223 phonostages that removes the clicks, pops, and “crackles” that even brand-new records often have (and that older, well-used LPs have galore), and it does this without touching the sound of the music itself. How Huber has accomplished this legerdemain I don’t know (and he ain’t sayin’). But on the basis of what I heard in Horgen (in what was admittedly a short audition), his de-clicking/de-crackling circuit works without any obvious sonic penalties. If this effect holds up under lengthier scrutiny (and I’ll let you know if it does), it is a helluva feat. By now you are probably wondering how this new-gen FM gear sounds—and how that sound compares to Switzerland’s current best? Well, I can’t answer that question definitively as, at this point, I’ve only heard FM’s “entry-level” Resolution Series offerings on one (excellent) loudspeaker—the Zellaton Reference Mk II. You’ll have to wait until I have more experience with a wider range of FM products paired with a wider variety of transducers for a more complete answer. But I can say this much already: FM Acoustics electronics preserve the native sound, the number, and the receptivity patterns of the mikes being used in recording sessions, along with a clear sense of the depth, width, height, and ambient signature of the venue in which those mikes have been set up, with extraordinary clarity and fidelity. 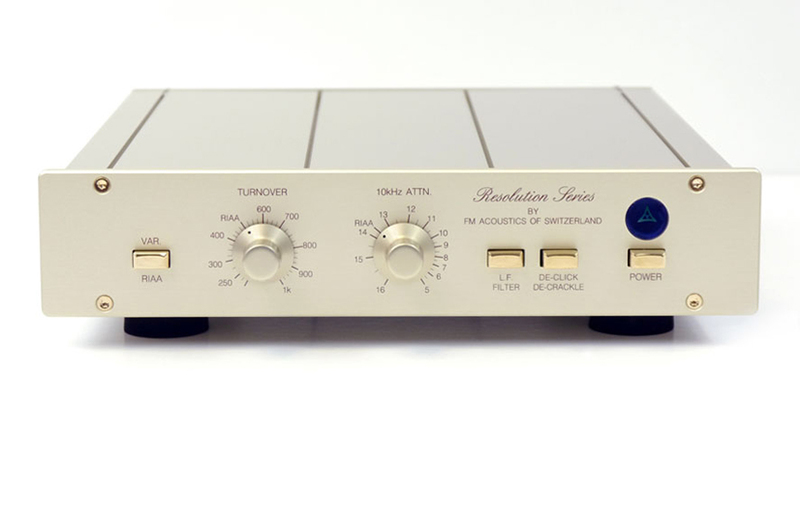 In other words, the FM preamp, phonostage, and amplifiers are exceptionally revealing of what the recording engineer was up to (and how well he succeeded). On well-recorded material, these electronics are also extremely revealing of the distinctive ways in which instruments are being played or lyrics sung. And yet this transparency to setup and source isn’t being bought at the price of an analytical presentation. On the contrary, there is a musical sweetness to the way that FM reveals instrumental and recording essentials that makes for consistently enjoyable listening. All you have to do is put on a well-recorded LP—such as the Pan Am reissue of Chet Baker Sings (which happens to include several monophonic cuts)—to hear what I’m talking about. As soon as Baker begins to sing—in that cool, sweet, and at this early point in his career youthful and beguiling tenor—you can hear him lean into that RCA 44BX (likely equipped with a breath filter in front of it) and immediately detect the way this great ribbon microphone “spotlights” his voice, adding forwardness, immediacy, rounded three-dimensionality, natural size, and (through the Zellatons) a hint of body to his West Coast-cool delivery, without also adding any excess chestiness, spittiness, leannesss, or sibilance to his timbre. It's as if Baker has stepped into a warm, bright pool of sonic limelight. At the same time, his trumpet, which is being played at a slightly greater distance from the 44BX, sounds more “set back” in the recording venue, though it too has immediacy, dimensionality, and natural timbral weight. The FM Acoustics electronics also preserve the flat though not ultra-extended (50Hz–15kHz) frequency response and the sweet, smooth, non-analytical recovery of detail of the 44BX, which makes for the warm, lovely, slightly soft but musically satisfying reproduction of transient detail on piano, hi-hat, and standup bass. I will have more to say about FM Acoustics (including several of its pricier offerings) when I’ve listened to its components with other loudspeakers in other rooms. But I don’t think FM’s basic character will change. This is very transparent gear that gives you a keen insight into how recordings are being recorded, how instruments are being played, and how ambient space is playing a role in augmenting timbre, dynamics, and imaging, and it is doing all this without adding any sense of the analytic or much color of its own. In other words, it is telling you the truth about LPs without robbing them of their inherent musicality. Regardless of the virtues of the newer Swiss gear (and there are many), this still remains a formula for highly entertaining playback, and FM Acoustic still remains a marque you ought to audition before making that ultra-high-end purchase.